I haven't seen a lot of interviews of David Tennant from the American side, so this SCI FI Weekly Interview is interesting from that point of view. It's pumping up the next series of Doctor Who, which is scheduled to start in the UK at the end of the month and on Sci Fi in June. 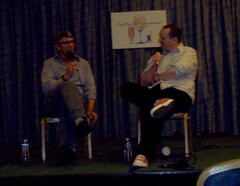 Also, there will be a couple of Doctor Who panels at Marscon this weekend. I'll be on at the LINDA Panel at 10:00 PM on Saturday. 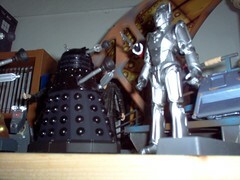 I use Google Reader as my feed reader for all of the various blogs and news sources on the net, and one of thing things that I've shared is my collection of Doctor Who items from around the net. It's on my main page for this blog, but it's another way to see a collection of the latest Doctor Who items as I see them as well. I was more interested to see Eric Roberts talk about Heroes than I was about ten-year-old Doctor Who, but still, seeing Eric Roberts meant that I've now seen all of the major actors with the 1996 Doctor Who TV Movie. And he didn't have a whole lot to say about it -- the most I got out was that he did the TV Movie because he had British friends that were familiar with the show. The TV Movie is not quite a Doctor Who footnote -- the TV Movie had a long shadow and I think you can see elements from the TV Movie being taken on in the new series, as well as elements that are a reaction against some elements of the TV Movie. For many years almost any first Doctor Who conversation I would have would revolve around that film, and it had been the focus of a lot of attention when it was the last bit of Doctor Who made for Television. I'm disappointed that the greater success of the new series hasn't motivated an attempt to clear up the DVD rights issues with the TV Movie in region 1. I had some hopes that as NBC Universal is a player in distributing the new series on the Sci Fi channel that might make it easier for them to release that as well. It's not classic Doctor Who, but I think it's an important piece of the forty five year Doctor Who story. I've been going to Gallifrey One for ten years now. It's been a mainstay of my convention-going life, and it's been interesting to see the convention evolve from the post-TV Movie environment, through the Big Finish era, and now the era of the new television series. 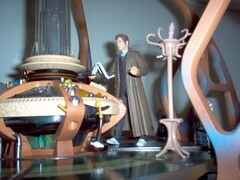 One of the interesting changes is how there are so many more quality Doctor Who toys. 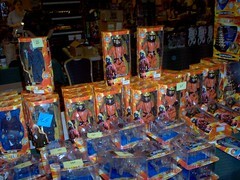 I've never seen so many as there were in the dealer's room this year. 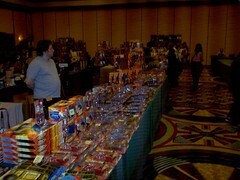 I didn't get an after picture, but by the end of the weekend, the entire table had been pretty well picked clean. 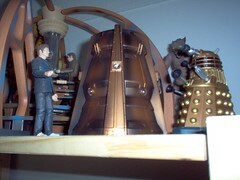 Of course, I couldn't resist getting a few toys of my own, including the TARDIS playset and some Daleks. 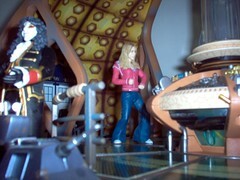 We've got some great pictures of The Doctor, Captain Jack, and Martha Jones. Of course, the story that I'm linking to also mentions some potentially massive spoilers if they are true. But this story links to a whole lot more pictures, and doesn't have the spoilers. Outpost Gallifrey has a list of 40 Public Television Stations that will be airing the Christopher Eccleston Doctor Who. I know for many long-time fans of the series public television is a nostalgic home for Doctor Who, and for many people that don't have cable, this may be their first chance to see it without getting the DVDs first. I'm sad that as yet Twin Cities Public Television isn't on the list! One of the interesting points that was raised in the comments to Paul's post looks at the motivation for limiting the "canon" to be just the Television Series, or whatever -- is to make Doctor Who something that you can understand all of. I'd be surprised if a person exists who has seen, heard, or read every Doctor Who story that has been officially licensed and released. I've thought for a while that the Big Finish audio adventures -- but also any of the other novels that take place in a "Past Doctor" time have a strange involvement with how time works in Doctor Who. There is something "current" about those, as well as taking place in the past. I'm not sure it has happened yet, and it might only happen vaguely for continuity reasons -- but I think it's inevitable that we'll see a Past Doctor story that at least strongly hints at Torchwood, for example. But I think we see how one story later in the Doctor's time line can impact previous ones -- The Gathering is a sequel to The Reaping, even though the sequel takes place earlier in the Doctor's timeline. And if you listen to the stories, you were certainly aware that (in the real world) the story was written after School Reunion and the Rise of the Cybermen. So the Doctor's entire history is rewritten all the time. But does this mean that the Doctor wasn't a Time Lord -- but something else entirely -- until some time before The War Games. Was the Doctor responsible for unleashing the Daleks on the universe as a result of his encounters with them -- he wasn't aware of the Daleks when he first went to Skaro, but given their importance to the universe as a whole that seems impossible. So perhaps they only became so powerful as a result of their contact with the Doctor and (perhaps) other Time Lords? No wonder the Doctor blames himself for the destruction of his own people. Iowa Public Television -- just south of where I am here in Minneapolis -- is going to be airing the Christopher Eccleston Doctor Who episodes. It's nice to see that Doctor Who is being made available to Public Television Stations, especially those that have been airing Doctor Who for decades like IPTV. I'm also hopeful that some of the other stations that used to air the classic series will pick up the new series as well now that there is a Doctor Who with a more modern look and feel. I'm very nostalgic about Doctor Who on public television -- it's one chance for it to be aired without commercial interruptions, and it was a part of a time when public television was a lot more dominant in the television landscape than it is today with the multitude of stations available on cable and satellite. Masterpiece Theater is showing The Ruby in the Smoke, which stars Billie Piper. It's based on a book by Philip Pullman. They have an interview with Billie Piper as well. And the week after Ruby in the Smoke Masterpiece Theater will be showing a new production of Dracula, which stars David Tennant's favorite Girl in the Fireplace, Sophia Miles.